Cartoon Retail Shopping, in Miniature!! I always say that I love miniatures! Cartoon-ish miniatures are even way more coolio! During the Emily Trudeau sign build, we got in a tv commercial build, and paused work on the sign. One fun job, right into another is OK by me! This job was to create 4 small environments for a toy product. These were a bakery interior, a candy store interior, a theatre, and an outdoor space! As with most tv builds.............4 days. As with all 2d stuff, I drew up all the pieces for each mini set in Corel, including the prints for the wall panels and flooring. The candy store was the first one to get drawn! Everything for all 3 stores was cut from .060 and .125" sheet styrene. There was only 2 items that actually got 3d machined for this. The rest was all 2d, assembled into 3d shapes. We didn't 3d print anything either. All of the counters, for the 3 stores were cut from 2" HDU. Super fast way to mass a curvy shapes! Once the shapes were cut, I wrapped them all in .020 styrene, leaving them short at the bottom, to resemble some sort of toe kick that a real cabinet would have. Wrapping these in styrene gave me a super smooth surface for painting, with zero sanding, except for the corner joints! My kinda cabinet building! Once the counters were all cut and assembled, I moved on to the cabinet type structures. Above is the ticket kiosk for the little movie theater. The rest of the cabinets and shelving were quickly assembled from the parts off the Techno. This is another one of those times that a little extra work in the computer, makes for a super fast assembly in the real world! Sometimes It can Be Sad When A Job Gets Finished! The very last things to do on the sign was to drill the holes for the butterfly, and flowers. These will go on the sign just before it gets mounted on location. Due to the freshness of the paint from the night before, we decided NOT to wrap the sign for it's 2 hour trailer ride to Tweed. Even though it was riding in an open trailer, and it was raining, I really believed it would be safer without any wrap sticking to the 12 hour old paint. The final pieces to our puzzle were the sign posts themselves. These were fabricated by our great friend Reg, at Brewster's Welding. He did such a fantastic job structurally welding the 4 polished stainless steel poles to their mounting plates. And as per the customer request, we had 2 cowboy boots, with hats, laser cut from .060 stainless steel sheet. Reg also welded these on for us! The sign arrived without a single mark, although pretty wet from the rain! However, as some things go, there was a miscommunication with the base plates that had already been set in the ground, in 5 feet of sono tube and concrete! 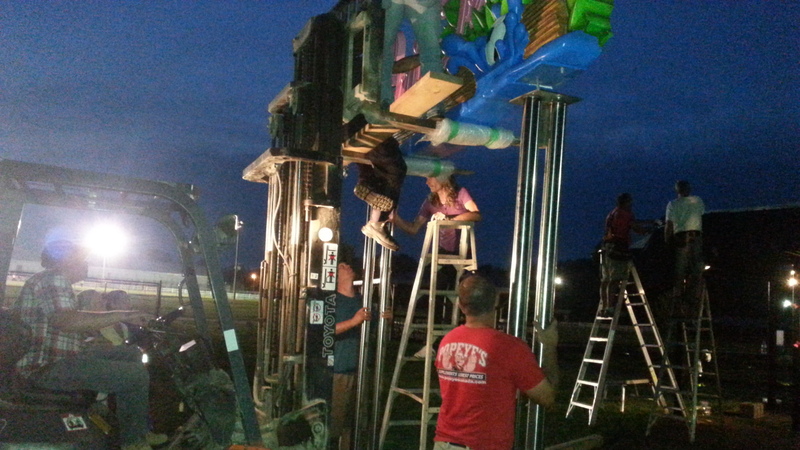 But in the spirit of the entire Splash Pad build, EVERYONE lent a hand to solving the problem. This included an amazing fellow by the name of Troy. Troy owns Dirty Crack Welding, and arrived at 7 pm from his other 2 jobs, and set to work immediately to rectify the issue. A true professional, dedicated to doing whatever it took! The picture is proof of how many people worked tirelessly to make sure this sign got installed for the 11 am grand opening. By the time we left, it was past midnight, and I do believe a few stayed until 3am to take care of the rest of the things that needed wrapping up. The grand opening was packed! Jody and I were amazed by the outpouring of support, from not only the Town of Tweed, but the surrounding communities as well. A remarkable turnout to say the least! The event started with heartfelt speeches from the family and friends of the Trudeau family, while the smells of french fries and hamburgers filled the air! Which the entire splash pad is themed around! Jody and I couldn't be happier with the outcome of the sign! I love the colors and all the elements involved. 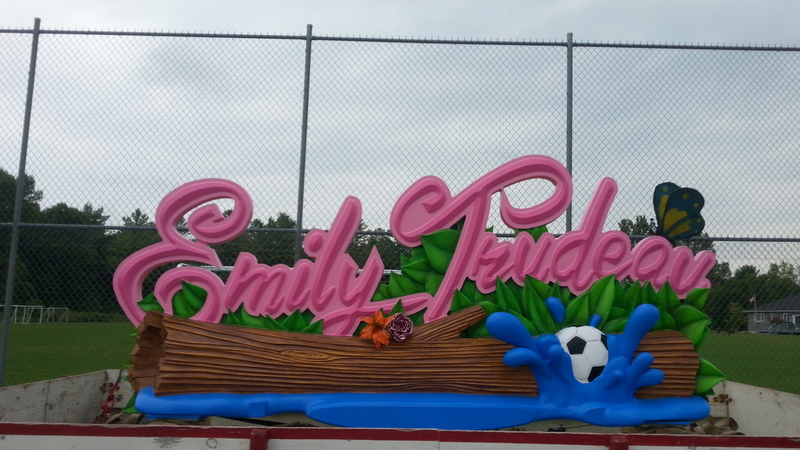 I wanted more than anything for the sign to look like it was pulled from a theme park, and delivered right here! We also have to thank Justin Monk, and Engine Communications, for reaching out to us to design and build this great piece! Justin had contacted me awhile ago, and sent me a quick sketch of what he was thinking. After discussing various ideas, we both liked the fonts, so I ran with that! He sent me off the text vectors, and we set to work! Justin and Engine Communications were great to work with, as they gave us complete control on designing something that would have a great wow factor. Answering as many questions as I could possibly ask! And being a quick phone call away! This was a truly great build! I wish I could mention everyone we met and worked with, but I would be afraid to leave anyone out, so here's to all of you! We are so grateful to get to work with amazing people on every one of our builds. Painting is a Jody's Best Friend! 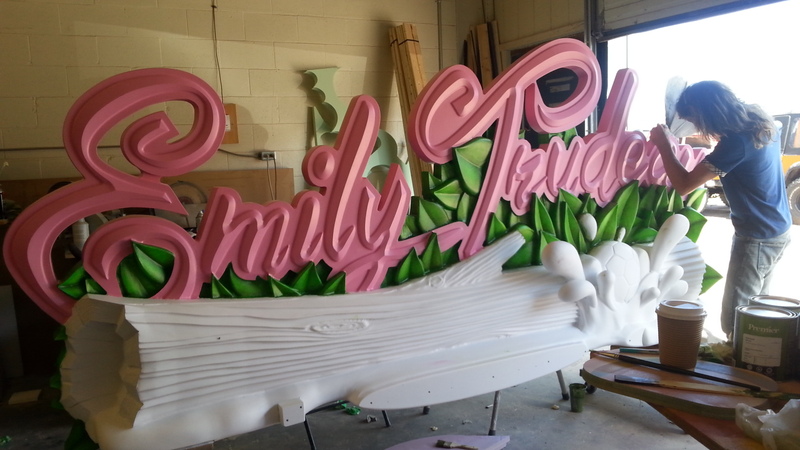 We kind of got sidelined on the Emily Trudeau Sign project last week, as we took a last minute miniatures build for a toy commercial. So that meant not much happened on the sign. But before we tackled the miniatures build, we wanted to be at the primer stage on the sign, at the very least! Once all the glue had hardened, we set about to tackle any seams that need some extra love, then we spent about 30 minutes hosing the sign down to remove the stubborn HDU grit from sanding. No paint failure for us! . This is a great opportunity to kind of see if, and where any water might collect and pool in the real world. It passed my water retention test! With the primer well dried by the commercial shoot delivery, Jody got to work right away on the painting! I did very little painting on this, Jody was like a paint brush animal! I did help with some of it, but not a lot of the cool stuff. I was just the basecoat guy! The leaves got 2 coats of base green, and 2 coats of glaze, each one darker than the last. However, I do remember painting pink, alot of coats of pink though. With the 2 color pink finally done, she moved onto the log. Usually on every job, there's a part that I really can't wait to work on, and a part she can't wait to work on. The log was it for her. She was so smiley the entire time! The words splash pad also got their paint job, as well as the 2 flowers. We didn't actually have time to sculpt the flowers, so we cheated a lot-tle. We actually purchased 2, over-sized silk flowers, and hosed them down with the polyester hard-coat. 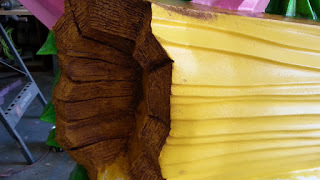 This bonded really well to the fabric petals, essentially becoming a fiberglass sculpture all on it's own. Then a quick paint job, and BAM, they were ready for mounting! I didn't actually get any final pictures of the butterfly though. We were a little crunched on the time, and some things slip through the cracks a little! The final parts to get painted were the soccerball, and the water portion. This sign will head out first thing in the AM, ready for it's road trip out to Tweed! The soccer ball and water splash came together pretty easily. I did have to scab on a couple of pieces to the large water splash. It wasn't worth 3d machining the little slivers that formed the last portion of the curve, as it was way faster just to shape them with a file! Every glued section of HDU got either a welded steel tube frame glued in, or a long straight piece for durability. I didn't have our Techno cnc pocket any of these, I just did them with a plunge router by hand. Largely cause I couldn't fully wrap my head around all the slots lining up in the computer. Once the pieces were all sectioned apart. I never got a picture of the main steel frame that went inside, but it was plenty durable! So the whole sign will mount to the posts via a 10 X 10 X 1/2" steel plate! Pretty heavy duty! But, sanding aside, it's coming along gangbusters! And we just kept moving forward with the laminating of all the layers! 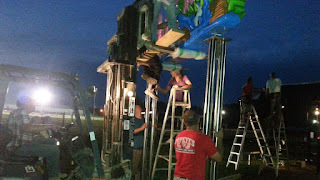 Lots and lots of urethane glue was used, as well as a few hundred screws! We have done a whole bunch of monument signs for other shops out of HDU, so awhile ago, I cut about 200 HDU tapered plugs. These get glued and hammered in over all the screws. Then they get quickly sanded off, and you would never know they were there. HDU can be a bit of a pain with the glue. The HDU sands way faster than the glue, so you have to be really careful not to cup the material on each side of the glue join. But these plugs make hole filling a breeze! And by the end of day 3, the front of the sign was complete! We didn't forget about the back of it the either! 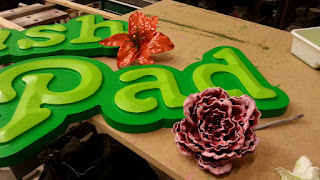 The 1" HDU became a low relief version of the leaves on the front of the sign. These were a mirror copy, so they would line up around the edges. I wanted the back to look like the text was sitting in the bushes, I think it worked out pretty good! As much as the computer makes things easy, it still requires some forethought, and software know-how to make it all come together! The first step was to bring the 3d log model into Aspire for texturing. I used my own woodgrain file I had created a while ago in Photoshop. I didn't want a realistic grain for this at all. Bending and manipulating the shape of the grain to fit the log was pretty easy with Aspire's bitmap distortion tools. Mostly it was just a matter of flaring the ends to match the log shape! Then with all the components arranged, I had to decide where I was going to split this out. The overall size of this job is 12 feet X 5 feet by 13 inches thick, so some thought had to go into getting it out of 4X8 sheets of material. The sign got split into 4 quadrants, then each quadrant got sliced into the 2 inch slabs that our material came in. In the end, there was 5, 2 inch sheets, and 1, 1 inch sheet of parts, that all looked pretty similar to the above image! This was pretty much 2 solid days at the shop! Listening to the dust collector for 8 hours a day is enough to make me want to explode my brain ears. But finally all the parts have been cut! Jody and I kinda worked side by side laminating all the panels up. Jody also got started on the sculpted butterfly that's going on the one side of the sign. This was a simple structure made from 1/4" welded rod, and some galvanized metal lath. She used Apoxie sculpt- epoxy putty for doing the final shape of the insect. Whatever I could laminate up off the machine, I would do right away, but with nesting all the pieces for the best yield, it pretty much meant I didn't have anything to assemble until the last sheet! Slowly though, we made progress on the assembly. All the water drops got 3/8" steel rods inserted in them, to make them securely attach to the sign body.